The past month has been especially interesting for our community, with the resignation of Linda DiSantis as president, and subsequent re-organization of the board. For more on that, see below. Meanwhile, Chuck and I have received Lullwater Estate news from afar, spending a few days in Paris, our usual June in Riga, Latvia, and another half week in a rural setting in beautiful Hesse, Germany. It's a cool damp summer in northern Europe, and landing in 92 degrees last week was a shock, but we quickly revved up our air conditioning, and prepared to celebrate the Glorious Fourth. We feel lucky to be able to watch a fine fireworks show, just another benefit of living (on the east side) in our lovely community. A barbecue with neighbors' mouth-watering food and good company also reminded us of our good fortune. Summer is the time and season for looking beyond ourselves, enjoying what is there, and reflecting upon the beauty of our shared resources. 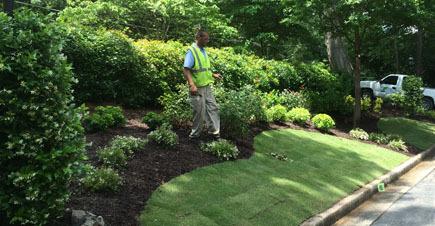 This year, renovated landscaping and plantings provide picturesque visual fields in front of both the Mansion and the Lullwater Road homes, as well as at the gate areas on Ponce. In the back, produce hot off the vine attests to the hard work of community gardeners. A discussion piece from the Woodland Advisory Group in this issue of Lullwater Latest, invites us all to consider how we might best enjoy and preserve that large portion of Estate property. Manmade structures also draw our attention. The Architectural Control Committee has completed its annual round of external inspections of our housing, and is sending its reports and recommendations to unit owners. A common technological upgrade from Comcast will soon be in place, whereby it is to provide stronger and speedier cable, internet, and phone connections. Your Board Members are here to help you. Michael Plemons and Susan Arnold represent the Mansion and the Lullwater Road owners, respectively. As President, I am dealing with Woodlands and other general resource issues, as well as communications. Vice President Jamie Ciomperlik is the point person on Landscaping and Architecture. Sharon Day is the Secretary of the Board, and her recorded Minutes of Board Meetings may be read on the LEOA website. Kathy White Radde (ably assisted by husband Todd) is the Treasurer. We would be remiss if we did not mention the ongoing work of Past President Shirley Hollberg as Chair of both the Social Committee and the Woodlands Committee. Also, we wish to thank Linda DiSantis for her contributions as Board President for the past eighteen months. The community garden at Lullwater Estate is thriving in its second year, and what used to be a kind of “iffy” area of the woodlands, has been transformed into a productive and tranquil place. 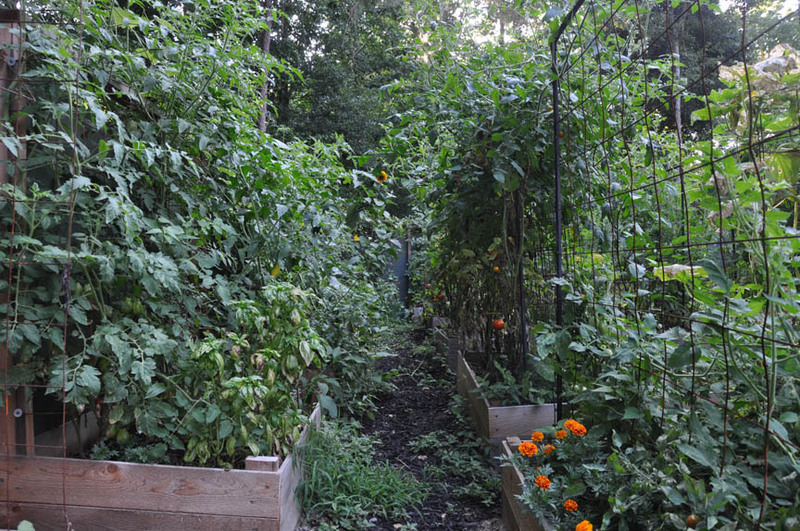 The garden provides an opportunity for neighbors to grow their own fresh produce who otherwise might not have a garden, and is a place of interest to passers-by who stop for conversations about what is growing or comment on its beauty. Gardening to put food on the table is a time-honored tradition, and often a solitary pursuit. In recent years, the physical and mental benefits of gardening have been well-known, even when a person is the sole caretaker of a plot. 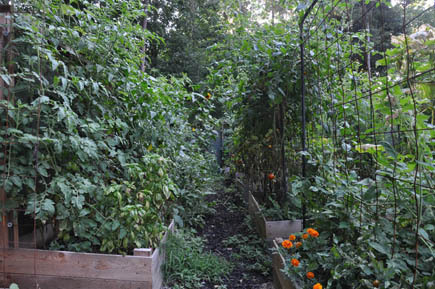 The garden plots are as individual as the people who plant them. Some just have vegetables, some fruit and vegetables, some vegetables and flowers. The site totals 15 gardening plots – each measuring 5 by 4 feet or 4 by 3 feet. Our community is unique for an urban townhome/condo development because of the large tract of undeveloped land we all own. This feature was an attraction for many of us who purchased homes here. Where else can one live so close to city amenities and yet see hawks perching in trees and hear the owls whoo-whoo after dark? Woodlands Advisory Group member Frank Muckler recalls when the woods were park-like, with a bare forest floor. It was possible to walk along the creek to view the spectacular grotto that survives from the Rainbow Terrace estate. When looking at a plat of our subdivision, about 40% of our property is the undeveloped and un-landscaped woodland area, land that asset deserves our care and stewardship. A review of 20 years of board minutes reveals an ongoing concern for the care of this treasure, but little continuity of planning and almost no budget allocation prior to the sheep grazing projects of the past two summers. 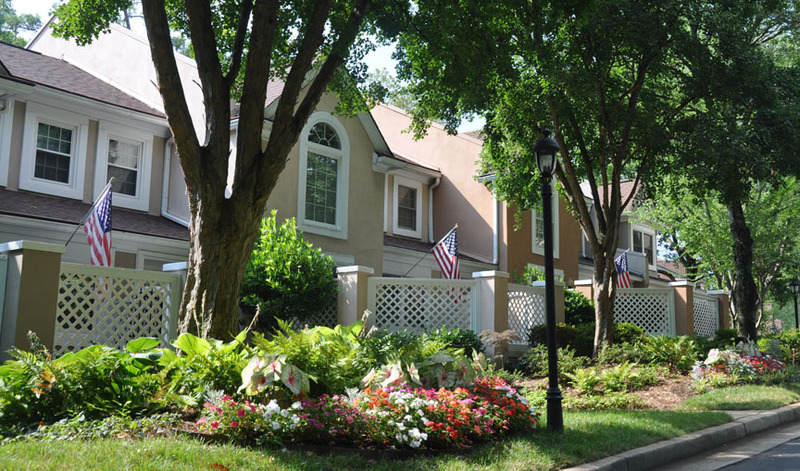 Create and maintain permanent access for the Lullwater Estate community to the woodlands by means of a perimeter path for maintenance, recreation, and to assure security of the property. Remove invasive plant species that choke out native plants and threaten our hardwoods, particularly English ivy, Wisteria and Chinese privet. Open the view through the woods to make it less attractive to trespassers and urban campers. Enhance the north and east property line woodlands to create and maintain attractive visual barriers between our homes and adjacent properties. Some residents have expressed concern that there is a motive to open a path through our property to the public. This is not a goal of the Woodlands Advisory Group. Efforts over the past two years have been limited to the above-stated goals. There are no other goals. Volunteers have provided hundreds of hours of work over the years, but it is unrealistic to depend on that forever. The fact is that those of us who love this community and intend to stay here keep getting older! A modest allocation of our budget will allow our natural areas to be maintained. Please let your board members know your feelings on care of the woodlands. Zone 1 - West of the creek and slope along Ponce de Leon (Don Kenagy), Zone 2 - East of creek, from Ponce to the Grotto (Frank Muckler), Zone 3 - East of creek from Grotto to NW corner (Frank Muckler), Zone 4 - North property line	(Lynn Hart), Zone 5 - East property line, from NE corner to rear of unit	(Bob Kerr), Zone 6 - East property line, from Ponce to rear of unit (Kamile Rasheed). Shirley Hollberg and Margaret Fuller are also members. Jamie Ciomperlik and Todd Radde are former members who contributed many hours to maintenance of the woodlands. Georgia Marshall has contributed horticultural expertise as well. Betsy and Chuck Marvin returned recently from several weeks in Europe, visiting friends in France as well as Marburg, Germany. In Paris they especially enjoyed a literary/historical walk based on the film, "Midnight in Paris." In Germany, the lovely rolling countryside of Hesse, dotted with quaint villages and dark forests, was the setting for many Grimm Brothers' tales, as they both studied at the medieval university there. The yearly Marvin sojourn in Riga, Latvia, spanned the month of June and several colorful folk festivals and operas. They rented a car to travel the byways of western Latvia and coastal Lithuania, a landscape full of storks' nests, manor houses and amber. Baltic cuisine is all comfort food, although in recent years it's gone upscale in some parts, and the fresh local ingredients, untouched by chemicals and genetic modification, remind them of farm food from their childhoods. On the eve of their departure, in Frankfurt, they received news of a grandson's birth in Canada, when Charles Rogers Marvin, "Charlie," was born to Colin and Vicky Marvin. They look forward to getting to know the little guy! 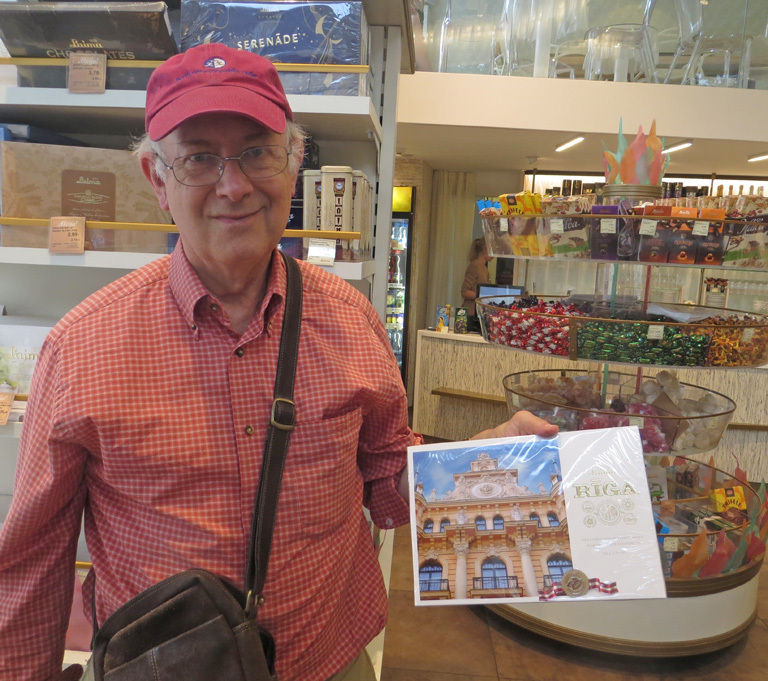 Chuck and Betsy visited the Chocolate Museum in Riga, and here he shows off a chocolate box cover picturing the beautiful building where he sometimes give courses. Recently, I had the privilege of participating in the Neighborhood Nestwatch. This project is a joint effort by the Smithsonian Institution in Washington, DC and Fernbank Science Museum. 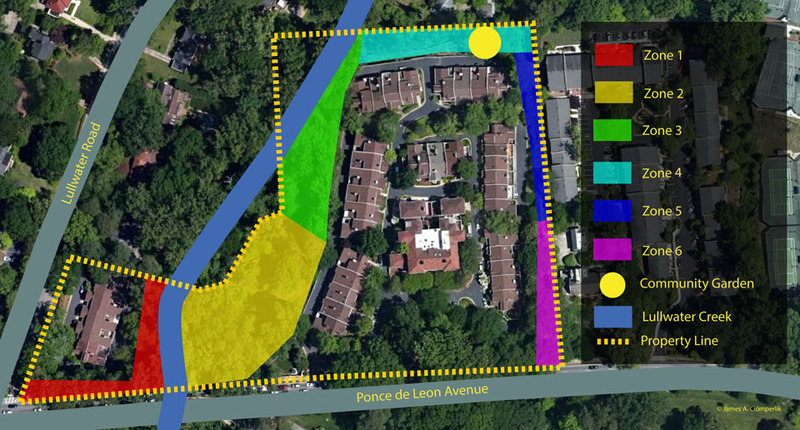 Neighborhood Nestwatch provides an experiential and educational experience for citizens and is a unique platform for important scientific research. Headquartered at the Smithsonian Migratory Bird Center in Washington, Nestwatch uses interaction between Smithsonian scientists, participants, and backyard birds to achieve research and education goals. I was contacted by Joy Carter, the President of the Atlanta Audubon Society, to see if I was interested in participating. 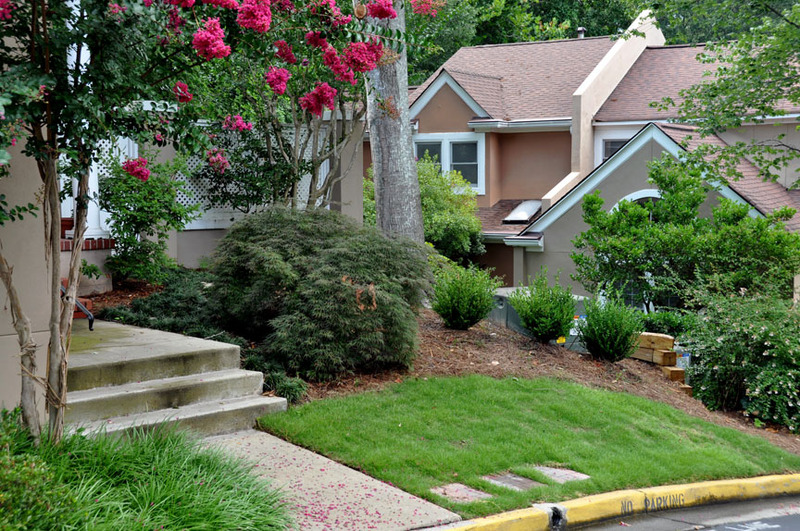 The project was specifically looking for some townhome communities in which to gather data. I serve on the AAS board with Joy, and was eager to participate in this exciting project when she called me. 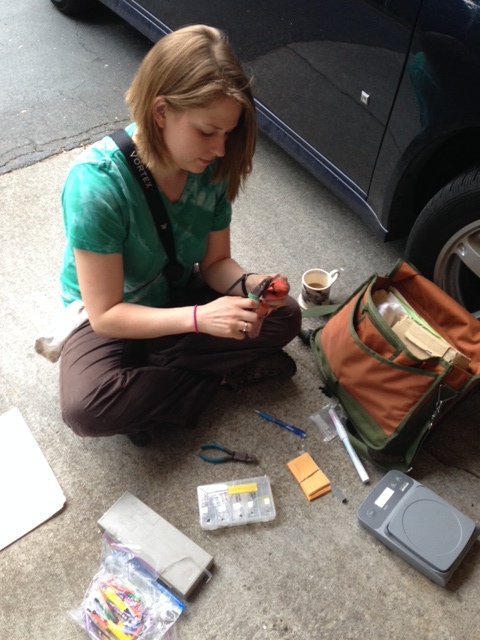 On the morning of June 3, a young researcher, Allie, from the Smithsonian showed up at my door at 6:30 a.m. Getting started that early was important because the birds do get up early. She did an assessment of the birds she saw flying around and then set up a net to catch some birds and band them. For the next 3 hours, she watched the net and checked for birds. We caught about 6 birds in the net. (It was not an ideal location.) Allie banded only one, a male Northern Cardinal, because the program is only tracking 10 common species of which the Northern Cardinal is one. I watched her as she placed a numbered metal band and a blue band on the Cardinal’s legs. She measured and weighed the bird and recorded information on its appearance. She also collected a few tail feathers for further research. I have include a photo of Allie at work. I haven’t seen the banded Cardinal since. So if you see him, please let me know so I can report his whereabouts. The other birds that we caught in the net included a sparrow with an interesting crossed beak. We didn’t know what may have caused that anomaly. We also had a couple of finches and a bird that we determined was likely a juvenile cowbird. It was interesting and fun to see the birds up close. Allie also checked the nestbox on our patio. 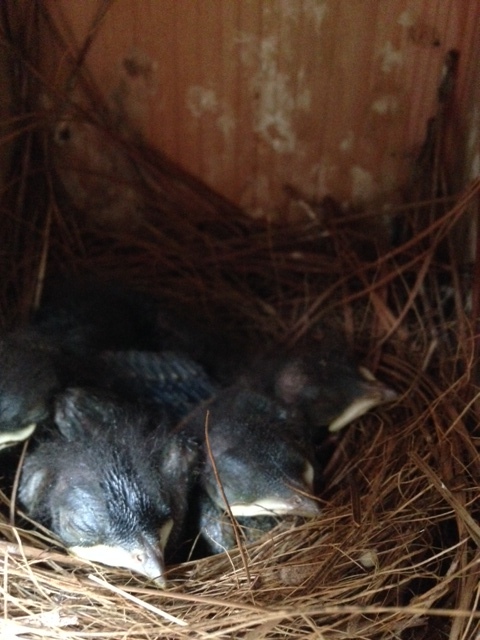 In the box were 4 Eastern Bluebird nestlings. This brood is the second one for my local bluebirds. They had already fledged a brood and were in the process of raising another group of babies. 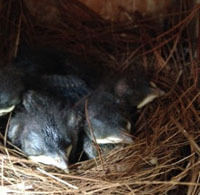 We took the attached picture of the nestlings sleeping that morning. About 10 days later, I saw the first of the fledglings jump out of the box and make its way to the fence around our patio. This project is a great example of a citizen science project. Many individuals, non-scientists, get a chance to gather data and contribute to the knowledge about how human populations and urbanization are affecting species. Birders are constantly reporting and counting birds that they see. This data gathering has been going on for decades and has contributed much to our understanding of bird populations and the environmental factors affecting their survival and reproduction. Neighborhood Nestwatch will be back next year to check again on the bird population in Lullwater Estate. Thanks for reading! The next issue of Lullwater Latest is planned for September. Since its foundation by the Decatur Preservation Alliance in 2000, the Decatur BBQ, Blues & Bluegrass Festival has since become an annual tradition to bring the community together. Come by to enjoy local bands, BBQ, and a cold beer. The Grant Park Summer Shade Festival presents a variety of options for the whole family! Register for the 5k Run for the Park on Saturday morning, and stay to reward yourself with a tasty treat from one of the food trucks. As you walk around, there will be live music playing for your entertainment and tons of vendors to check out. Largest Multicultural event in the state of Georgia. Since 2000, the event featured hundreds of exhibitors, family activities, art and craft, international foods and high profile outdoor music exposition and concert with renown International recording artist as well as local performers. The George Hart Men's breakfasts continue to solve the world's problems on alternate Wednesdays, 8 a.m., at the American Roadhouse over on North Highland. The next meeting is July 23. Join the friendly group for a hearty meal and congenial conversation. All men at Lullwater Estate are welcome. For further information, contact Hilton Fuller. Summer reading is nothing different for the Lullwater Literary Ladies, as they make it a twelve-month occupation. On July 17 the meeting at Margie Ann Morris' house features a book about Hawaii called Unfamiliar Fishes, by Sarah Vowell. Readers will enjoy authentic Hawaiian foods! The August 21 meeting at Georgia Marshall's is a conversation about The Language of Flowers by Vanessa Diffenbaugh, and on September18 Dave Eggers' What Is the What will be discussed at Shirley Hollberg's. This is the story of some lost boys from Dafur and their eventual graduation from an American college. Presented as a novel, it's very close to nonfiction. Meetings begin at 3:30 for chatter and nibbles, and the book talk starts at 4:00. All Lullwater Estate women are welcome to attend. For more information, please get in touch with the monthly host. A very special thanks to the Mucklers and the Hembys for creating beautiful flower beds for all to enjoy. Year after year, we have ogled at the lovely bouquet of bright flowers, caladium, and ferns! Margaret and Jim Newsome enjoyed a delightful family vacation (13 of them) on the beach at Isle of Palms in the Charleston area. They had two fish fries (7 pounds of flounder each time) and ate out some also. The weather was perfect, which added to everyone's good time. Fox Brothers in New York! Bill & I had a great weekend in New York in early June when the Fox Brothers presented two meals at invitational venues. The first was dinner at City Grit, and the second was lunch at the James Beard House. Our son, Bennett, is director of culinary operations for Fox Brothers, and he reimagined the Fox Bros. menu as fine dining uniquely for each event. The Beard House lunch was a marvel of refinement and presentation, but with all of the authentic Southern barbecue ingredients and flavors intact. We also toured the 9/11 memorial and museum and saw "A Gentleman's Guide to Love and Murder" two nights before it won the Tony for best new musical. A fun weekend! 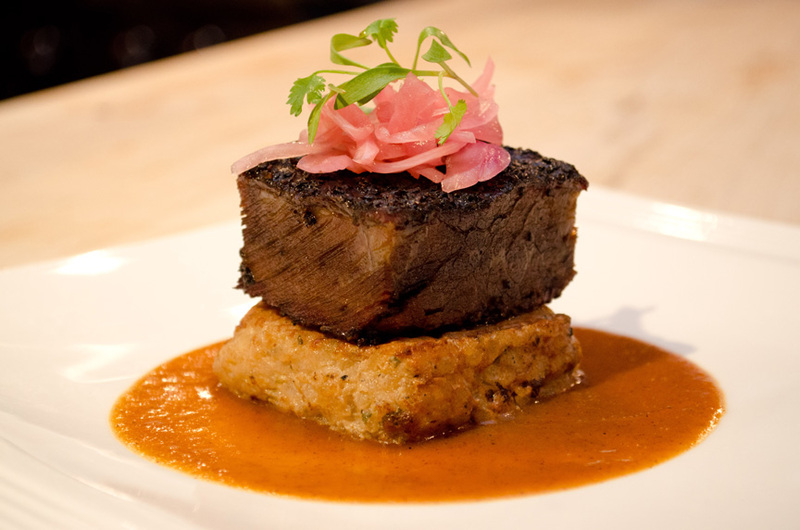 a photo of the entree - Smoked Salt and Pepper Short Rib, Hatch Chili Risotto Cake, Pickled Onions, Micro Cilantro and Chili Gravy. Residents need to remember that "on-street parking" on our lanes is reserved for visitors, except for loading and unloading. The yellow-curbed fire lanes are never to be used for parking either by residents or visitors. Please make sure your vehicles are not in the lanes, and that those of others are not blocking the pathways of people trying to drive through. Chuck and Betsy are also celebrating the successful completion of a PhD in Mathematics by son Andrew. He has spent the past few years working on his degree at Cornell University, and will be teaching there in the fall. The editors would like to thank Chuck Marvin, Shirley Hollberg, Linda DiSantis and Margaret and Jim Newsome for contributing to this newsletter. We welcome items from all residents, anytime. We love having guest contributors, and welcome your tales of travel, stories of staying home, and other small articles! Please send them anytime to Betsy Marvin. The newsletter needs photos! We welcome photographic contributions of our residents and around the community grounds. Please send any you might have taken to Jamie, and please include a caption or explanation of your picture! We place “classifieds” only for residents, who also may, on a one-time basis, recommend a service or business they have used. Copyright © 2015 Lullwater Estate Owners Association. All rights reserved.